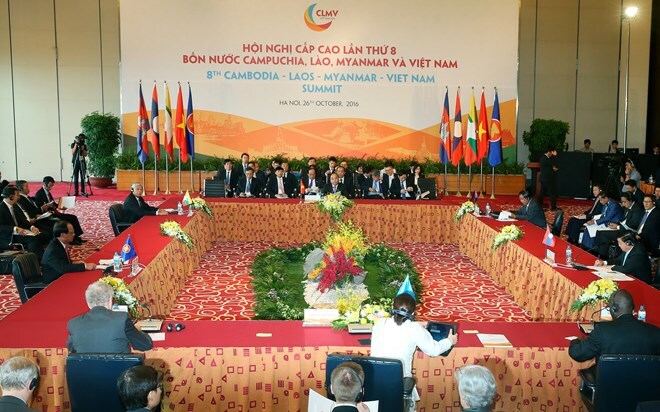 Hanoi (VNA) – The leaders of Cambodia, Laos, Myanmar and Vietnam (CLMV) agreed on an array of cooperation measures towards a seamless connectivity among them at the 8th CLMV Cooperation Summit (CLMV 8) in Hanoi on October 26. At CLMV 8, themed “Seize Opportunities, Shape the Future”, the participating leaders shared the view that the CLMV countries are holding many big economic development chances which come from the global science-technology revolution, the region’s strong economic integration, and the formation of the ASEAN Economic Community. They also boast a number of important competitive edges like the location in close proximity to major markets, rich natural resources, abundant and young workforce, and favourable trade and investment policies. The leaders also pointed to the challenges facing the Mekong Region, including limited human resources, underdeveloped infrastructure, climate change impacts, regional and global economic instability, and small, open economies’ vulnerability. To maintain growth momentum and improve competitiveness, they agreed to concurrently reform domestic economy, maintain macro-economic stability, create an optimal business environment, and proactively integrate more strongly into the regional and global economies. They also agreed to implement concrete measures toward a seamless regional economy so as to link their economies and markets ever closer together. In transport connectivity, the CLMV nations will accelerate the building of missing links and upgrading roads along the North – South Economic Corridor (NSCE), East – West Economic Corridor (EWEC), and the Southern Economic Corridor (SEC). They will construct an expressway connecting Vientiane and Hanoi to facilitate the movement of goods and people between the two capitals. A feasibility study on a route linking Myanmar, Laos and Vietnam will also be conducted. To facilitate trade and investment, the leaders agreed to step up the simplification and harmonisation of cross-border procedures and further develop industrial zones along the corridors. They will promote border trade via harmonising member countries’ border trade procedures and developing a network of border markets, carry out trade and investment promotion activities, and facilitate the investment of CLMV enterprises in each other’s markets. The participants endorsed the economic ministers’ plan to develop a framework for CLMV development which aims at advancing economic development, enhancing the capacity to reap the benefits arising from regional integration, and raising the living standards of our people. Regarding industrial cooperation, the four countries will foster collaboration in industrial policy development, standardisation and conformance, and small and medium enterprise policy development. In tourism, they are bound to fully implement the 2016 – 2018 Action Plan on Tourism Cooperation, particularly measures to ensure sustainable and responsible tourism, and encourage greater coordination and exchanges of information and experiences among the member countries. They will facilitate the participation of CLMV tourism agencies, associations and enterprises in the regional events and fairs, while promoting public – private partnerships, particularly in tourism promotion activities and tourist product development. In human resource development cooperation, the four countries will continuously implement the CLMV Scholarship Programme funded by the Vietnamese Government for the 2016-2020 period, and establish a database of labor market’s demand and vocational training programs in CLMV countries. They will also promote joint programs among CLMV universities, language training institutions and exchange programmes between educational leaders, high officials, experts, teachers, administrators and students. The nations are set to promote mutual recognition of qualification among them. Addressing the summit, Prime Minister Nguyen Xuan Phuc called on the countries to make timely adjustments to catch up with new global trends and not to be left behind. The four countries should create a new development momentum characterised by technologies, high-quality human resources, innovations and creations, instead of pursuing the growth model based on natural resources, cheap labour costs and outdated technologies, he said. The Vietnamese Government is resolved to do its best to serve people and businesses, the leader affirmed, pledging that Vietnam will make all-out efforts to ensure macro economic stability and accelerate economic restructuring towards innovations, creations, higher productivity and competitiveness. At the same time, the country will implement three breakthrough strategies on institutions, human resources and infrastructure, while removing administrative barriers to create the best possible climate for domestic and foreign investors and enterprises, he stated. To improve the four countries’ competitiveness, the PM suggested boosting their connectivity in infrastructure, trade, investment, tourism and human resources development. He appealed to development partners to continue supporting the four countries’ efforts in socio-economic development, regional integration and sustainable development.